Launched back in the now distant 2005, the venerable Imperia Online in not only one of the oldest free-to-play MMOS out there, but also one of the more beloved and popular ones. Contrary to what its long-lived stature might suggest, however, Imperia Online is a product of constant dedication and effort to remain fresh and innovative, having been upgraded and reinvented several times throughout its existence, as evidenced by its current Version 6, launched in late 2013. Like a sword put to the flint over and over by the meticulous hand of a master smith, with its latest update, 'The Great People', Imperia Online has been sharpened into a cutting edge gaming experience. 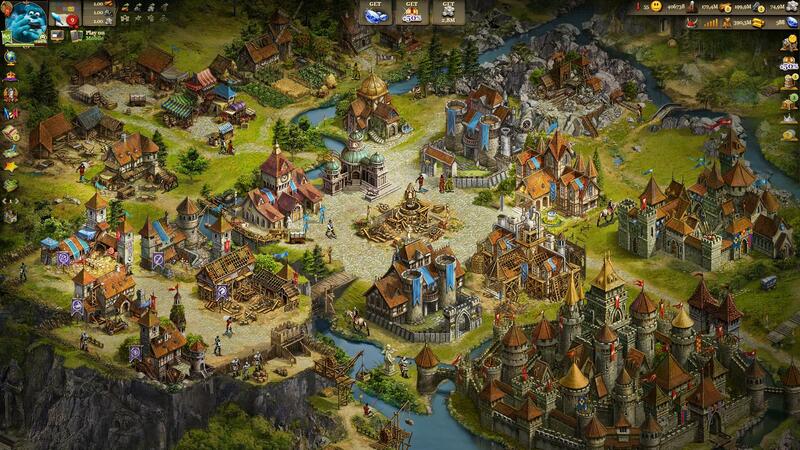 The first and most obvious upgrade concerns the visuals: crisp, colorful and bustling with more detail than ever before, the art of Imperia Online brings your medieval empire to life, in a gorgeous 2D hand-drawn style. In fact, there are three distinct visual styles in the game - European, Russian, and Arabic, - depending on which language is used for account registration (and with more on their way, according to the developer). What interests most games however is gameplay – so what can you expect on that front? Existing mechanics have been tightened and streamlined, or in some cases revamped and expanded. Technologies, for example, will now be split between two research buildings, dedicated to warfare and economic disciplines respectively. The tech trees have been expanded with a number of new researches to compliment and enhance the multitude of new gameplay options. The greatest new feature, however, and the one that gives its name to Imperia Online's latest version are the Great People. You can find them, fittingly, in one of the new buildings – the Palace. This is the place that houses all of your nobility, and from which you can issue all associated appointments and review profiles. The Great People come in two flavors: members of your royal family, and aristocrats. From the very beginning, you are given an Emperor and an Empress, each with their unique skills, and inborn talents, and couple of their children on their way into adulthood. Depending on a player's play style, some talents are inherently more useful and, while not immediately apparent, you can, in fact, breed a royal line to your tastes. As the young heirs come of age, they become Great People in their own right, and one of them (which you can select at your leisure) will inherit the crown once your old Emperor passes away. Of course, to perpetuate the dynasty you must find your bachelor ruler a spouse - either among one of the aristocrats, or by arranging a marriage with another player's royal descendants. While all this may seem busywork at a glance, children have a high chance to adopt a talent from one or both parents, so paying attention to who you make the royal successor and who you marry them to actually pays off in the long run. The skills your Great People possess are divided into two categories: civic and military ones. It is depending on these inclinations that you would be wise to appoint a particular character in one of two corresponding roles – either as a Governor of one of your holdings, or as a General to protect your kingdom and lead the campaigns of your army. With all the new features and additions on offer, you'll be forgiven not ask about the end game in Imperia Online, but there is one. At a preset time before the end of a game Era, the 'Lords of the Realm” event is initiated. In it, Alliances fight for dominion over several neutral Castles, spread all around the game map. Conquering a Castle expands the owning Alliance's sphere of control over the surrounding area, granting bonuses to allied territories, and suppressing enemy holdings within. When time runs out, the amount of each Alliance's influence is taken into account, and the one with highest share withing the realm is declared the ultimate champion of the Era. Do you have what it takes to rank among the best of player and earn the honorary title 'Lord of the Realm' for yourself? Well, what are you waiting for? Enter the world of Imperia Online and find out!